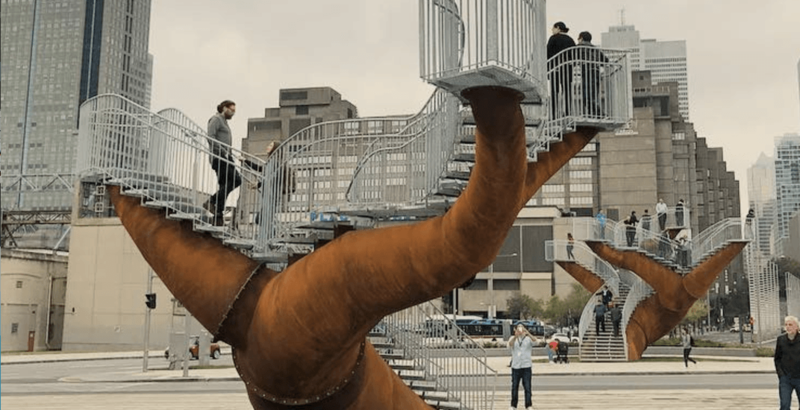 Montreal’s Bonaventure park is officially open and a new urban boulevard has taken over the raised highway that was once there. The $142 million project allows pedestrians to walk freely through a number of green spaces and has a number of very cool features that are worth checking out. The park is definitely Montreal’s newest Instagram hotspot. What stands out most are the new art installations. Source was created by artist Jaume Plensa, who wanted to honour the importance of water and the impact it has had on the city’s history in terms of communication and immigration. The piece also represents the roots of the city and its energy, diversity, and vitality. Dendrites by Michel de Broin is composed of two climbable structures meant to embody tree trucks. Visitors can climb up the winding structures to admire the green space from a higher view point. The park also includes two permanent ping pong tables, one children’s play area, a Trekfit space for outdoor training, lounge chairs for relaxing, and picnic tables. Over 300 trees were also planted to enhance the area and create a beautiful green space in the city.